Sorry for the clutter, feel free to delete my other posts here (including this one) if it makes your thread more coherent. I don't think we could handle another Lightstar owner ! Just imagine one owner who is going to have 6 of them! Its going to be insufferable! OBI56 wrote: Just imagine one owner who is going to have 6 of them! Its going to be insufferable! I hear you there buddy !!!!!!!!!!!!!!!!! "Some peoples Kids"
You can thank DaveS... It's all his fault, he is the one that started my OCCD. I seem to have perfected my sniping abilties over the last few months. Toymaker said 'Someone has to pay for the next Lightstar amp !!! Well mine is over in Ft. Myers waiting to be delivered. The Constitution is not an instrument for the government to restrain the people, it is an instrument for the people to restrain the government - lest it come to dominate our lives and interests”. If Dave and James will let someone else play. I know of at least 2 people here in Ohio actively looking (besides me) after hearing my rig. I got amp #9 a few months ago. Found it at a local shop and had to have it. The sound is amazing. Congratulations!!! Welcome to a very exclusive club!!! Welcome!!!! 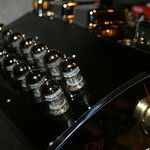 You now own a great amplifier! I will NEVER part with my Lightstar! Doesn't that mean #9 Snoop??? ?